While Sweden may have lost their UEFA EURO 2012 opener against host nation Ukraine, courtesy of a brace from former Milan striker Andrei Shevchenko, it was a current Milan star centre-forward, was impressing for Erik Hamren’s side. Zlatan Ibrahimovic was central to all of the Scandinavians’ good play, scoring their goal and mustering a total of four shots, a haul only five players could better during the first round of group games. The towering former Barcelona man was rarely out of the action in the game against Ukraine, drifting all over the pitch and challenging for a total of 18 duels, more than any other player in the first round. Expect the big man to keep John Terry and Joleon Lescott very busy on Friday. 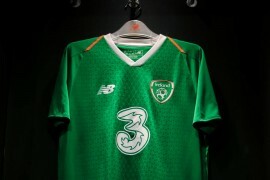 While Ibrahimovic has used his physical strength and presence to good effect all ready in UEFA EURO 2012™, England striker Danny Welbeck, at 21, nine years Ibra’s junior, used his speed and mobility against France during the Three Lions’ opener against France. However, while Ibrahimovic carried a goal threat for the Swedes, Manchester United starlet Welbeck, shackled by England’s defensive tactics, spent much of his time closing down the French rather than troubling their goal. However, the striker did hold the ball up superbly for England, and rarely lost it, a fact borne out by his passing accuracy figure of 92%, a rate only Dutch star Robin van Persie could better (only including strikers). 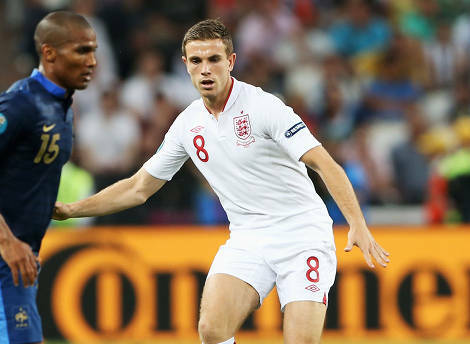 With Sweden losing to Ukraine and England drawing with France, both sides will be desperate for a win this game. Both the charismatic Ibrahimovic and the willing Welbeck may well both play key roles in the outcome of this very finely-balanced clash. England manager Roy Hodgson has expressed concerns about the fitness of his central midfield pair, Steven Gerrard and Scott Parker, leading to the possibility of Jordan Henderson getting more than just an extended cameo against Sweden on Friday. Castrol EDGE Performance data shows that the maligned Liverpool youngster has had a far more positive impact this season than he is credited for. When Henderson has started, Liverpool have won 40% of their matches at an average of 1.43 points per game. When he has not, Liverpool have won 25% of their matches at an average of 1.13 points per game. Liverpool have also been more creative with Henderson on the field, averaging 1.3 goals per game when he has started and only 1 goal per game when he has not. Roy Hodgson’s new look England side got their UEFA EURO 2012™ campaign underway with a decent draw against group favourites France. While the goal from Les Bleus came courtesy of a well-worked goal from Samir Nasri, England’s strike was more prosaic, coming when centre-half Joleon Lescott headed home Steven Gerrard’s inswinging free-kick. 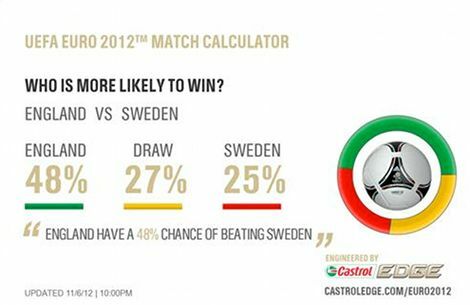 According to Castrol EDGE Performance analysis, the make-up of the goal came as no surprise, as 38% of their 13 goals since the start of last season (including the one against France) have been from headers. As well as proving to be potent in the air, England have also impressed from dead-ball situations over the last 12 months, with four of their goals coming from set-pieces. 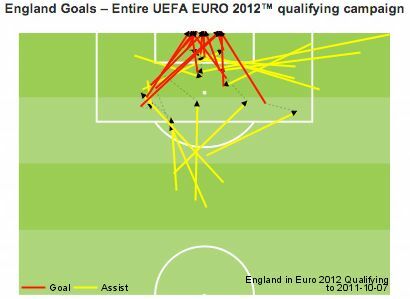 Five of England’s 13 goals since last August have also come from crosses, with two more originating from the flanks. This strength from wide areas (see graphics below) was apparent all the way though England’s UEFA EURO 2012™ qualifying campaign, particularly from the right flank. Can England shrug off the ‘Defensive’ label they’ve acquired under Hodgeson against a desperate Sweden? 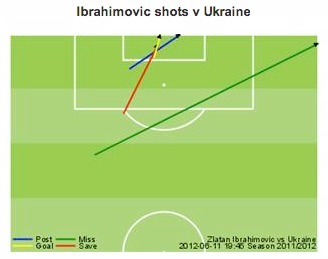 Or will Ibra’s class show through against a dogged English defence? This is exactly how we want you to think! Put 3 men on Zlatan leaving Elmander and KĂ¤llstrĂ¶m unmarked. Good luck and may the fairest result happen.